· Naphill Village Hall, outside the side entrance door. This defibrillator is in a locked cabinet, when you dial 999 the ambulance service will give you the code. · RAF 1 Site (the one with the aeroplanes out front). The Guardroom at the main gate has a defibrillator in a non-locked cabinet that you can ask the guard at the gate for access to. AED in the Guard room at the main entrance to 1 Site, RAF High Wycombe. Phone 999 and if directed to 1 Site, RAF High Wycombe go to main gate and ask guard for the AED. You will be asked your name and the guard will give you the AED. · 3 Site (off Main Road between Kilnwood and the Co-op). The Guardroom at the main gate has a defibrillator in a non-locked cabinet that you can ask the guard for access to. 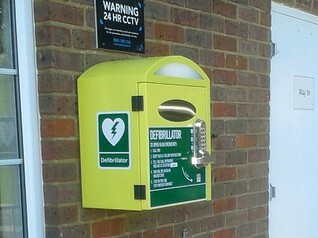 AED in the Guard room at the main entrance to 3 Site, RAF High Wycombe. Phone 999 and if directed to 3 Site, RAF High Wycombe go to main gate and the guardroom is outside of the controlled area. Go to the window and ask guard for the AED. You will be asked your name and the guard will give you the AED. · The Sports Hall off Kilnwood has a locked PAD on the outside just like the one at the Village Hall. the cabinet so you can access the AED. ambulance service will tell you where that is and the code to access it if required. Send someone fast! · The defibrillator talks to you, repeating itself until you move to the next instruction. · Keep going with CPR and the defibrillator until the ambulance arrives.